First Impressions of Bruce Springsteen’s “Wrecking Ball” – Track #10 – “Land of Hope and Dreams” - Stream this reborn Springsteen classic on Late Night with Jimmy Fallon! To hype the March 6th release of his new album, Wrecking Ball, Bruce Springsteen is releasing each of the record’s eleven tracks online, one per day, streaming for free at various music websites. I’ll be giving you my first impressions – not reviews, mind you, as I’m not comfortable reviewing anything without hearing the full album – of each track as they are streamed. Today, we enter the home stretch with track #10, “Land of Hope and Dreams,” streaming all day for free at Late Night With Jimmy Fallon (a fitting home for the song, since all of Jimmy’s musical guests this week are playing Springsteen tunes, along with two appearances by the E-Street Band itself!). This song should be familiar to most Springsteen fans, since he’s been playing it live since 1999, but the context it appears in on Wrecking Ball adds many new layers of meaning. Read my thoughts on “Land of Hope and Dreams” after the jump…. It’s actually a direct rebuttal of Woodie Guthrie’s “This Train is Bound for Glory,” which was based around which types of people should be excluded from the train. Springsteen includes everybody, because he believes that the best America is one that is a safe, free haven for all types of people, a place where someone can make a fresh start no matter where they were born or how they were raised, or even what mistakes they made in the past. That’s the America Springsteen believes in, and in “Land of Hope and Dreams,” he lays it all on the line. Flash-forward to 2012, where “Land of Hope and Dreams” has been recorded in a studio as the penultimate track to Wrecking Ball. Like the title song – which was also performed live before appearing on the album – the piece takes on many new layers of meaning and subtext when heard in its new context. In fact, of all the songs on the record, I’d say “Land of Hope and Dreams” is the most open to interpretation; listeners could perform dozens of different readings based the lyrics, the performance, the production, and where the song is placed on the album, and each analysis would be equally valid. Personally, this recording of the song speaks very differently to me than the live version did, and it all boils down to one crucial tonal alteration: in the live cut, I’ve always felt Springsteen sang in character as an immigrant from long ago who believed wholeheartedly in the promise of the United States, singing without a trace of cynicism or doubt. On the album version, however, I hear the song as a somber, downtrodden reflection on the promise of America, with the singer questioning whether or not this dream still exists. 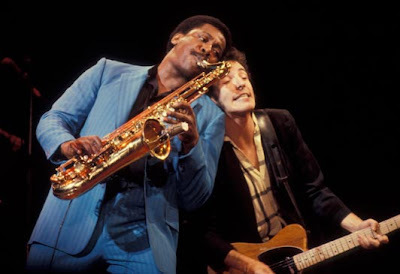 Where Springsteen’s vocals were big and anthemic in concert, his vocals here are sad, almost like mourning, and as the song moves along, he becomes increasingly desperate, as though these ideals are all he has left in the world, and the only way to hold onto them is to sing. Even the main, grand instrumental riff has subtly changed; it’s sped-up and slightly modulated to sound similarly desperate, rather than wholly triumphant. To me, all this colors the song in a very different light. One must also consider where the song is placed on the album, and as I said yesterday, I believe it functions as a highly spiritual two-part piece with “Rocky Ground.” “Ground” is the story of a group of people (the collective characters of the album, I believe) so beaten down by life that all they have left is their faith, a faith they are rapidly losing confidence in. Nevertheless, they continue to hope, and as they do so, they reflect on why they hope, and this is where “Land of Hope and Dreams” comes in. It’s a meditation on the beliefs that keep them strong; the sad, pained quality of Springsteen’s vocal performance acts as an expression of the difficulty in maintaining faith in unproven beliefs, a difficulty all these characters are experiencing at this moment. Their faith operates on two distinct levels. The first is the American context the song has always been about – can these dreams of prosperity and acceptance ever come true? As we’ve seen across the rest of Wrecking Ball, the outlook on that front is becoming increasingly bleak, which is part of why the song sounds so sad on this album. The second level of this faith is spiritual, perhaps even distinctly religious: if we’ve been denied these gifts in this life, if we’ve all been travelling over rocky ground for so long, then will we find salvation after we’re gone? In this regard, the Land of Hope and Dreams is heaven itself. The lyrics can just as plausibly be interpreted as a vision of the afterlife: “You don't know where you're going now, but you know you won't be back…leave behind your sorrows, let this day be the last/tomorrow there'll be sunshine and all this darkness past…” A spiritual double meaning is etched into every line of the song, evident most strongly in the “train” imagery. The train, where “saints and sinners” alike are welcome, where “whores and gamblers” find acceptance, where “lost souls” can be at peace, where “dreams will not be thwarted” and “faith will be rewarded,” where “you don’t need no ticket,” and where the destination is “fields where sunlight streams.” Isn’t this what heaven is all about? As the song moves along, the music becomes bigger, Springsteen’s vocals more intense, and the entire production grows in passion and power. To me, this represents the singer and the other characters reaffirming their beliefs, working through their doubt and grief by remembering the ideals that inspired them in the first place. As they do so, and as the song builds, the piece becomes more and more about a journey to the afterlife, with all the characters from throughout the album getting “on board” to transition into the next phase of being. I’d argue Springsteen makes the implication explicit: Michelle Moore – the female voice in “Rocky Ground” – returns at the end to chant the crucial “People get ready” line, acting as the song’s guiding angel, while Springsteen – earthly voice of the everyman – chants “You just thank the lord.” And most tellingly – to my mind, anyway – Clarence Clemons still provides the song’s rousing saxophone solo from beyond the grave; when I reach that point in the track, I imagine him as the conductor of the train, returning briefly from the great beyond to help his friends make the journey. When the song ends, the destination of this journey, and even the certainty of its existence, is still in doubt, but to Springsteen’s mind, that’s not the important part. What matters is that these people have chosen to hold onto their faith and ride the train wherever it may take them; the characters of this album have departed, and whether they find salvation in this life or the next, they will continue to hope, and as long as they do, the “Land of Hope and Dreams” exists in one form or another. This, to my mind, is foundation of what Wrecking Ball is all about. The core message of the album, as posited by the title track, is that the human spirit is indestructible, and with “Rocky Ground” and “Land of Hope and Dreams,” Springsteen has used highly spiritual terms to tell us why he believes this. It all comes down to hope. In our darkest hour, we cling to a belief in the promise of a better day; when we start to reflect on our collective vision of that new tomorrow, our hearts grow strong again. There are no songs of defeat on Wrecking Ball, because each character, no matter how dour their situation, possesses that innately human – perhaps even uniquely American – ability to believe. With all this established, “Land of Hope and Dreams” could very well have been the album’s final track. It would certainly be an emotionally satisfying ending. But Springsteen’s thematic tapestry isn’t quite complete. All the messages delivered up to now were just laying the groundwork for Springsteen’s final, greatest point: the significance of a strong, indestructible spirit. What does it mean for us as individuals, or as friends, or as family, or as Americans? All will become clear tomorrow, and I think you’re going to like how it all wraps up…. My full, official review of “WRECKING BALL” will be published on SUNDAY, MARCH 4th.